OCBC Bank customers have a new, speedy way of resolving a common issue when shopping or dining: Not having the right credit card to enjoy the best discount, rebate or reward. 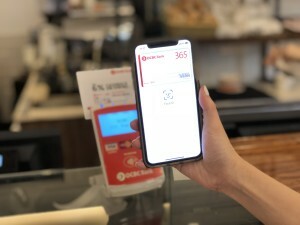 Since last month, OCBC Bank became the first bank to enable customers to transact at merchants that accept Apple Pay within minutes of applying for a new VISA credit or debit card. Any OCBC Bank customer – even if you do not yet own an OCBC Bank card – can apply for a card online and have your application approved almost immediately. There is no need to then wait for the physical plastic to arrive in your mailbox: The card can be accessed and provisioned (that is, added to) Apple Pay instantly via the OCBC Mobile Banking app. VISA cards make up almost 80 per cent of the OCBC Bank cards currently provisioned to Apple Pay. Instant provisioning of cards for use with Apple Pay has been enabled for OCBC Bank VISA credit cards – including the 365, FRANK, Voyage, Robinsons Group, Plus! VISA and NTUC Plus! cards – as well as the Yes! debit card. OCBC Bank is one of the top credit card issuers in Singapore and the market leader in contactless payments; one in every two VISA contactless transactions, including Apple Pay, is made with an OCBC Bank card. Monthly mobile wallet payments have doubled since 2016, while the number of credit cards provisioned to mobile wallets has increased sevenfold. 60 per cent of OCBC Bank cards provisioned to mobile wallets are on Apple Pay. Mobile wallet usage is especially popular for lifestyle transactions including groceries, transport such as private hire cars, food deliveries and fast food. OCBC Bank has constantly worked towards making banking seamless and embedded in our customers’ natural behaviour and interactions. OCBC Bank led the way in Singapore in launching voice-powered conversational banking for retail customers in February 2018, which allows customers to ask Siri to check their bank balances, credit card overview and make e-payments. It was the first bank in Singapore to introduce biometric authentication to access bank account details with OCBC OneTouch in March 2015, and OCBC OneLook in November 2017 on the OCBC Mobile Banking app, leveraging fingerprint and facial recognition technology. OCBC Bank then offered customers the convenience of banking on their wrist, launching its mobile banking app for Apple Watch in March 2016. In November 2016, OCBC Bank enhanced its OCBC Pay Anyone e-payments service by enabling customers to send money via OCBC Pay Anyone directly within Apple’s iMessage on iPhones, and via any app on Android devices using the OCBC Keyboard in August 2017.